Slaughterpit is this Saturday!!! Haerken (death/battle metal – Birmingham), Uncoffined (death/doom metal – Durham), Drekavac (black metal – Aberdeen), and Evil Blood (old-school thrash – Glenrothes/Dundee) will be ripping up the stage at Church Dundee. 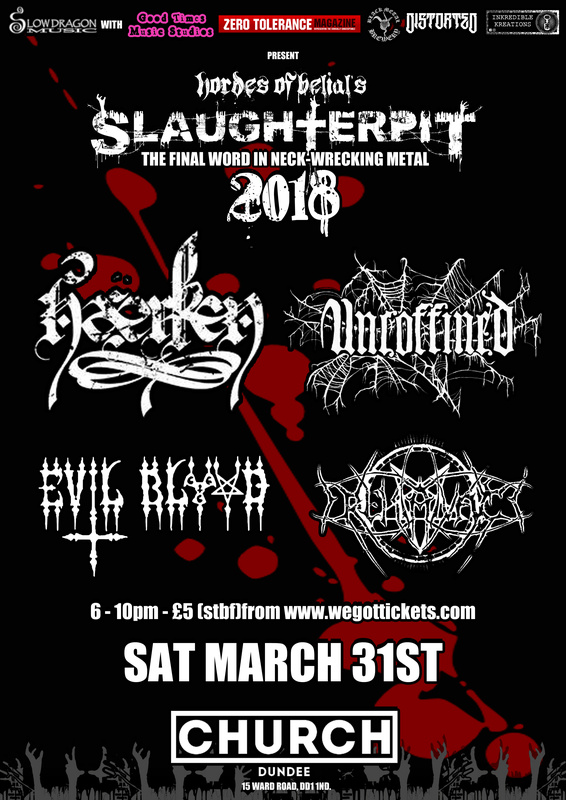 Get your advance tickets for just £5 from wegottickets.com or Grouchos record store, and be in with a chance to win shirts and tickets to Hordes Of Belial – Nine Lives! 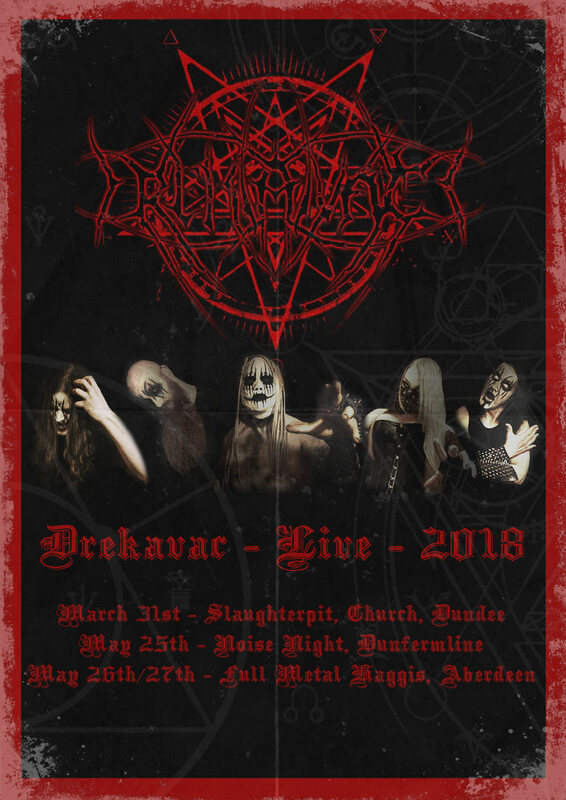 This isn’t the only event of the season for Drekavac, though, as they are currently looking to expand their campaign of live, black metal onslaughts, already billed for Full Metal Haggis and Dunfermline’s Noise Night. On April 27th, neo-classical/ambient solo project, Dreamfire, will issue a reworked and expanded version of the original Atlantean Symphony, via Minotauro Records. Edinburgh based Perpetua – currently out on tour in England with Seed Of Sorrow – released a killer new video for their track Corrupt this week. Witch Tripper reveal their fresh collection of eclectic groove metal, I, Of The Storm, at their launch event at the Old Sal in Nottingham on April 14th. Pre-orders are available from Bandcamp, itunes, Google Play, and Amazon Music. 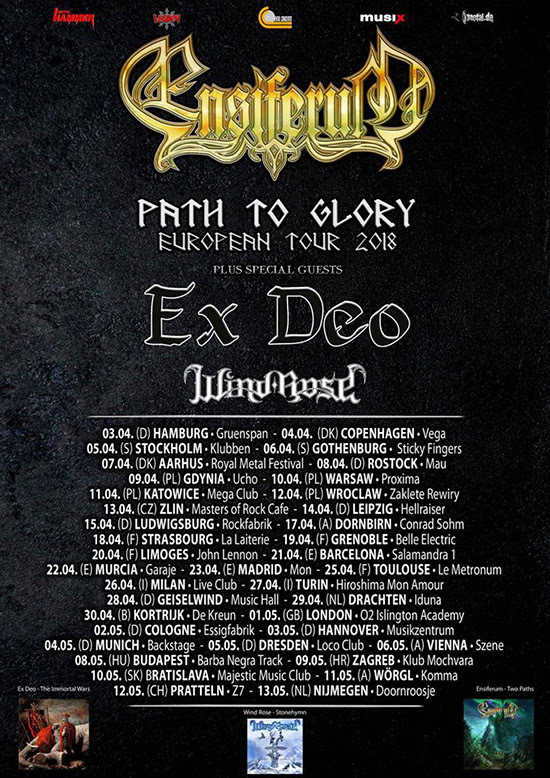 Finnish metallers Ensiferum embark on a mammoth European tour in April, taking with them Ex Deo and Wind Rose as support. With nearly 40 dates in just over the space of a month, it’s sure to gather some attention before the September release of their Two Paths record. Posted in Latest News and tagged Atlantean Symphony, Church Dundee, Corrupt, De Profundis, Downfall Of Mankind, Dragon Fire, Dreamfire, Drekavac, Ensiferum, Evil Blood, Ex Deo, Flotsam And Jetsam, Godforsaken, Grouchos, Haerken, Hordes Of Belial, I Of The Storm, Korzus, Minotauro Records, Napalm Records, Nervosa, Nine Lives, Old Sal, Perpetua, Ratos De Porão, Seed Of Sorrow, Slaughterpit, Slow Dragon Music, The Blinding Light Of Faith, Uncoffined, Very Metal Art, wegottickets, Wind Rose, Witch Tripper.